The Allure of Nymphets: BEAU PERE (1981): "I'm Not a Little Girl...I'm a Woman!" 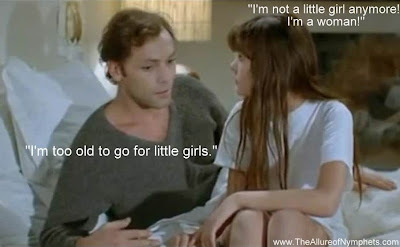 BEAU PERE (1981): "I'm Not a Little Girl...I'm a Woman!" In the last post I wrote about The Adolescent (1979) [French: L'adolescente] and how, despite the 13-year-old Marie's convincing argument, Alexander, a 30-year-old physician reluctantly refuses her advances. In Beau Pere (1981) [English: The Step-Father], 14-year-old Marion attempts to convince Rémi, her 30-year-old widowed step-father, to overcome his inhibitions and reciprocate her love. Unlike Alexander, Rémi eventually succumbs to the Marion's seduction and begins an affair with the nymphet. I wrote in The Allure of Nymphets that a common faux paus of ephebophiles is that they pressure nymphets into making their relationship public, but Rémi unintentionally uses reverse psychology and tries to convince Marion to keep their relationship a secret, which only makes her want to make it public.